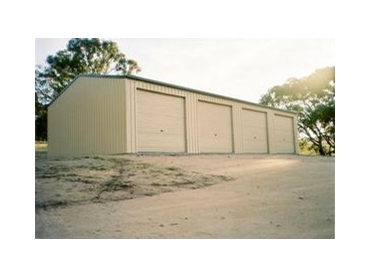 The range of rural and machinery sheds is manufactured from quality high - tensile RHS frames by Shed World . The 4 Door Gutters with Side Entry, are part of this sturdy range, built to withstand the ravages of time. As all rural and machinery sheds, these 4 Door Gutters from Shed World come with a wide range of bay sizes to suit all situation. They also feature a galvanised heavy duty 'C ' section frame allowing for utilisation of internal space and a clean appearance.